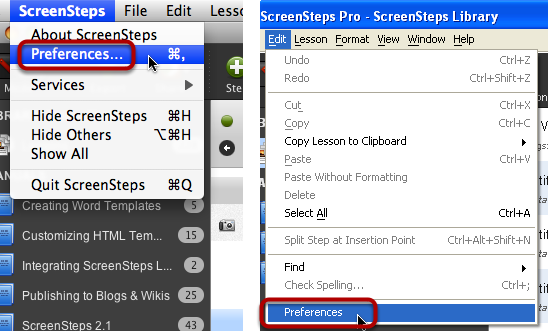 This lesson will show you how to configure ScreenSteps to instantly publish your lessons to the Clarify-it.com sharing service. You can use Clarify-it.com to share the documents you create in ScreenSteps Desktop with the world. Instantly get a URL back that you can share via Twitter, Facebook, instant messages, emails, forum posts or wherever else you need to share your ScreenSteps documents. To enter your Clarify-it.com credentials or create an account open Preferences. The image on the left shows how to do this on OS X. The image on the right shows how to do this on Windows. In the Clarify-it.com tab, enter your username (or email address) that you used to create your account and password in the provided fields. If you would like the data sent between ScreenSteps desktop and Clarify-it.com encrypted then check the Use SSL box as well. After entering your information click the Test Connection button. This will verify that your username and password are correct. If you see the green check mark then you are ready to begin sharing your lessons with Clarify-it.com.